Rental for a Car Boot Sale lot for 2 days (3-4 Dec 2016) at the upcoming ALWEHDAH CARnival! 2016. NOTES: New/Preloved/Used Ladies & men fashion; baby & kids products; household items are encouraged. Food and beverages: Only specialty products and sampling of food/beverage that are unique to your brand identity are permitted. No illegal or prohibited products allowed. No financial, insurance, or MLM products & services allowed. Rental for a Flea Market Stall for 2 days (3-4 Dec 2016) at the upcoming ALWEHDAH CARnival! 2016. NOTES: New/Preloved/Used Ladies & men fashion; baby & kids products; household items are encouraged. Food and beverages: Only specialty products and sampling of food/beverage that are unique to your brand identity are permitted. No illegal or prohibited products allowed. No financial, insurance, or MLM products & services allowed. IMPORTANT: Each Flea Market Stall comes with two 1m x 1m tables (i.e. total 2m x 1m). No powerpoint provided. If a dedicated powerpoint is required, contact abdulqader@alwehdah.org (additional charges apply). 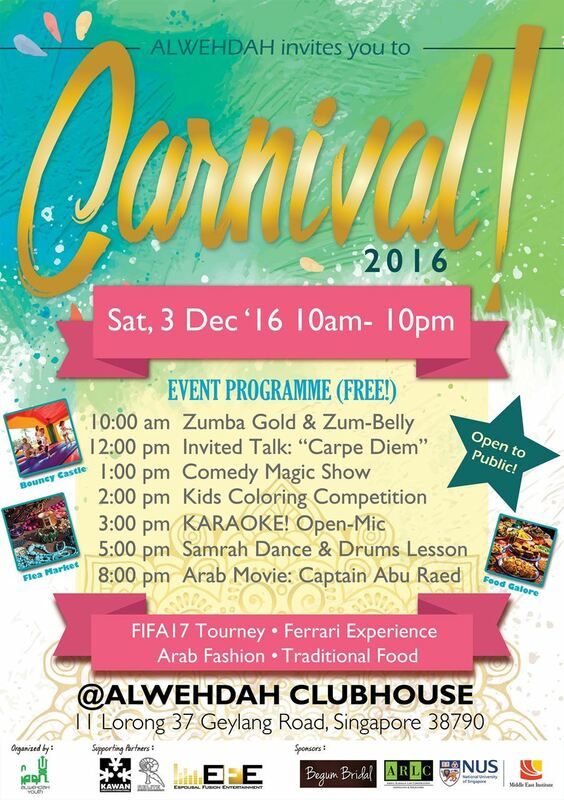 Rental fee for a Food Stall for 2 days (3-4 Dec 2016) at the ALWEHDAH CARnival! 2016. Note: Each Food Stall comes with two 1m x 1m tables (i.e. total 2m x 1m) and 2 power points. IMPORTANT: As per NEA requirements, food handlers must be certified. Stall reservation is confirmed ONLY upon receipt of full payment amount.